Blue Canyon | Rockwall Rocks! The fabulous new Blue Canyon Kitchen, Tavern & Wine Bar and Rockwall’s new daily news and info website, http://www.rockwallrocks.com, have cooked up something special for people who love to eat great food for great prices! Now – for a limited time only – you can “Buy one dinner, Get one free” at the chic new restaurant at The Harbor on Lake Ray Hubbard by simply visiting the easy-to-use website, clicking on the ads at the tops of many of the 50+ pages and following the simple instructions – which tell you to email your reservation date and time request via the website’s Contact page rather than phoning in the traditional way. To take advantage of this special offer, phone reservations are not accepted; you must email your reservation request at least 24 hours in advance. The promotion is only available Sunday though Wednesday nights, including Sunday brunch and lunch. Blue Canyon is not open for weekday lunches. The creative “Internet Age” joint-promotion is designed to increase awareness and use of both the new website and new restaurant. More publicity about it will begin to appear soon across the County. FYI, after you send your email request, you’ll receive a confirmation email that same day or evening from the website, confirming receipt of your request. Soon after Blue Canyon will email you, confirming your requested date and time, or suggesting an alternative, if the restaurant is already booked. Phone numbers are also available on both websites to call in case there are any questions. Visit both http://www.rockwallrocks.com and http://www.bluecanyonrestaurant.com for more details. Popular local artist and art community leader Vicki Hoarty (right) was all smiles as usual Friday afternoon as she and her friend enjoyed the gorgeous weather, beautiful surroundings and live music on The Blue Canyon patio at The Harbor. Blue Canyon General Manager Thomas Allen was also there, ensuring all his customers were happy. Blue Canyon Kitchen, Tavern & Wine Bar at The Harbor donated $3,500 to Helping Hands this afternoon as they had promised to do as the result of a fundraising event held at Blue Canyon last January during their grand opening celebration. 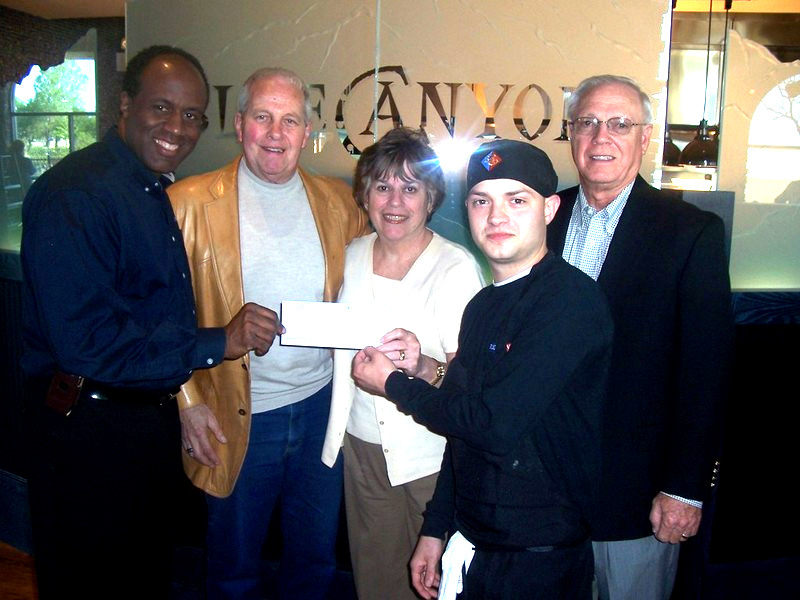 Shown below doing so are Blue Canyon’s General Manager Thomas Allen (left) and Executive Chef Scott Coffman (center right) who presented the check to Helping Hands Executive Director and City Council member Margo Nielsen (center). Also shown are Helping Hands Board Chairman Bennie Daniels (center right) and lifetime member Marvin Sexton (center left). In celebration of the Blue Canyon Kitchen, Tavern and Wine Bar’s grand opening at The Harbor in January, owner Brandt Evans teamed with Rockwall County’s non-profit Helping Hands assistance agency and its Executive Director Margo Nielsen to host a benefit fundraising event. The event raised $3,500 and offered attendees an evening of culinary delights, with an array of dishes from Evan’s creative American cooking and samples of his custom wines. The check will be presented by Evans to Margo this Friday at 5:15 pm at Blue Canyon. The donation will be used by Helping Hands to assist Rockwall County residents with utility and shelter bills, educational expenses, health care, food and transportation. Last year, Helping Hands provided financial aid to more than 3,000 County residents and more than 4,000 residents at their Health Center. If you or anyone you know needs financial assistance, the agency can generally make utility payments of up to $200 per year per family. 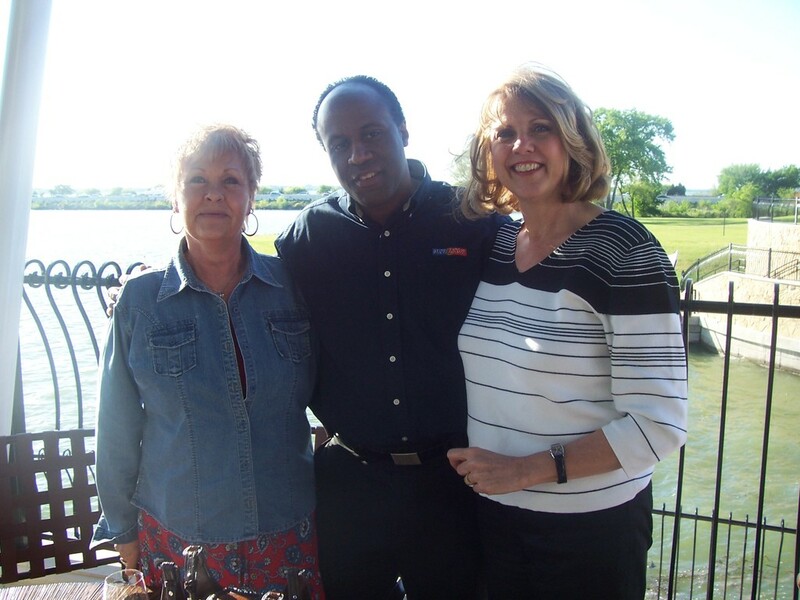 Helping Hands serves residents of both Rockwall County and the City of Rockwall. It’s an extremely well-managed agency and very worthy of donations.